This police station was allocated for the police traffic warden department. It lies in the part of Rotterdam-West that was destroyed in 1943 when the Allies mistakenly bombed it. 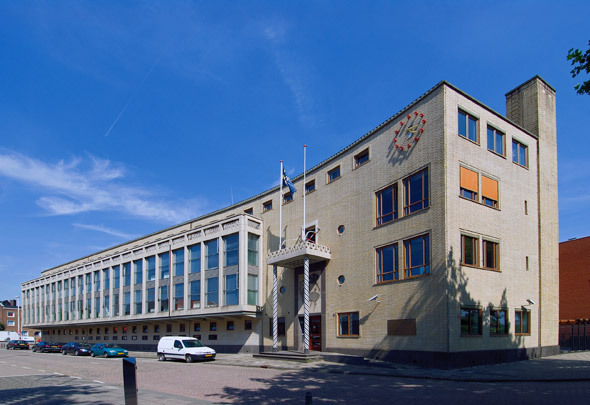 The gently curving L-shaped building has its main entrance on Hudsonstraat. This is marked by a concrete awning with a balcony, two freestanding columns and an artwork by Ian G. Pieters depicting the struggle between good and evil. The police's task of protecting the public is illustrated by Kees Timmer in the head elevation on Schiedamseweg. In the 1980s the police station was enlarged with new-build across the street and in the early 21st century with a seamless extension at the rear.